We custom design services that fit your personality, fashion sense, and busy life—you are more to us than just a head of hair. We want to create a great style for you that compliments your sensibility, bone structure, and body type, and we strive to give you healthy, beautiful, wearable hair that you love and a style that puts some attitude in your step. Steve understands the importance of continued education and often sends team members to attend state-of-the-art educational seminars across the country. He teaches his team the latest and best hair and skin techniques, while encouraging them to develop as stylists. Steve empowers them to provide their customers with exceptional service. 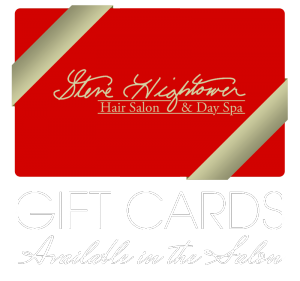 Steve Hightower Hair Salon & Day Spa stands behind its technicians, services, and products. If you are dissatisfied with your experience, for any reason, we will make every effort to remedy any concerns. Please notify us within 1 week of receiving a color or service and 2 weeks of receiving a Keratin service. The philosophy at Steve Hightower Hair Salon & Day Spa can be summed up in one word: teamwork. One artist can create a satisfactory experience for a client, but a team can create a memorable experience. Steve and his team of highly-skilled technicians work together with their clients to provide incomparable service. We encourage honest feedback from our clients, as well as from each other, which results in a culture of learning and understanding that benefits our clients and increases the awareness and education of our team members. Steve’s team acts as a family serving one purpose. They understand the necessity to serve the customer, as well as each other. Under Steve’s leadership, they operate as a unit—creating an unmatched salon experience. Copyright © 2019 Steve Hightower Hair Salon & Day Spa. All rights reserved. Salon Web Design by StyleNet.